A key provision of the ACA is the requirement that it provides certain recommended preventive care services at no additional cost to patients—that means no cost-sharing or co-pay. Research shows that preventive care saves lives and improves health by identifying illnesses earlier, when they are still treatable and manageable. The ACA preventive care requirements apply to all plans, except those that have been grandfathered–those that have been in existence prior to March 23, 2010. An estimated 26% of employer-sponsored plans in 2014 were grandfathered. Over time, it is likely that all employer sponsored plans will lose their grandfather status. Evidence-based screenings and counseling. Screening for depression, high cholesterol, diabetes, certain cancer, obesity, HIV, STDs as well as drug and alcohol counseling, healthy eating and other health concerns. Routing immunizations. Plans must provide routine immunizations as recommended by the ACIP. These cover immunizations such as influenza, meningitis, tetanus, HPV, hepatitis, measles, mumps, rubella and varicella. Preventive Services for Children and Youth. Besides immunizations identified above, this includes behavioral and developmental assessments, iron and flouride treatments, screening for autism, vision impairment, lipid disorders, tuberculosis and certain genetic diseases. Preventive Services for Women. Plans are required to provide additional services for women, including well-woman visits, all FDA-approved contraceptives and related services, broader screening for STDs and HIV, breastfeeding support and domestic violence support. One test that has been included in the ACA guidelines is testing for BRCA 1 and BRCA 2–the test that determines if women are genetically at high risk for breast cancer. BRCA1 and BRCA2 (Breast cancer genes 1 and 2) are the best-known genes linked to breast cancer risk. BRCA1/2 mutations can be passed on from either parent and can affect the risk of cancers in both women and men. The test, which costs an estimated $3K, was formerly an out-of-pocket expense, and prohibited many women from getting the screening. A clarification to the ACA means that this screening is now covered with no additional cost to women whose family histories show a high incidence of breast cancer, putting them at high risk. For these at-risk women, the ACA may also covers certain medications that are intended to prevent breast cancer. If appropriate, they can receive chemopreventive drugs, including tamoxifen and raloxifene without a co-pay. These are just two drugs that have proven to be risk-reducing treatments for women with a genetic predisposition to breast cancer. These important changes to the healthcare laws are helping people stay on top of disease and potentially dangerous conditions, allowing them to stay healthier and avoid the high cost of treatment after diagnosis. Preventive care is also a more cost-effective strategy, as it hopes to circumvent the extreme and expensive Hail Mary efforts that become necessary once conditions have escalated. 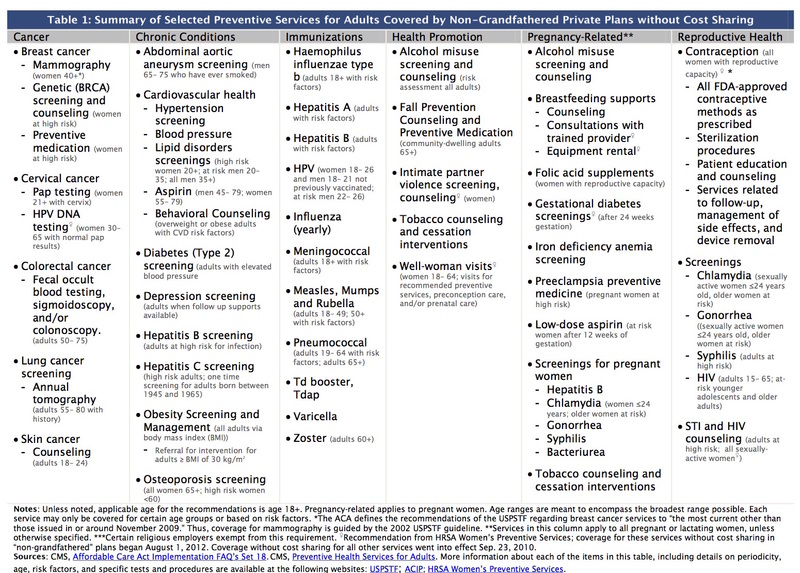 The chart below identifies the tests and screenings that are covered under the ACA’s preventive care provision. Please click on the image to enlarge. Small businesses that have not yet changed over to ACA plans need to do so for 12/1 or will be without coverage. This is the time to choose the plan that’s best suited to your and your employees’ needs. Contact Carly Barker @ CJB Insurance Services: 510.342.2670.